Dr. Pierre Girgis, a board certified Neurosurgeon, is a Phi Beta Kappa graduate of Emory University, where he graduated with honors in Biology and received a Howard Hughes research fellowship for his investigations of G-protein cloning in Chlamydomonas reinhardtii. After college, he enrolled in the College of Medicine at the SUNY Health Science Center at Brooklyn, where he developed his interest in Neurosurgery. Following his internship in general surgery, he entered Neurosurgery residency, completing his training at the University of Rochester Medical Center. During residency he developed a broad interest in all aspects of Neurosurgery and joined the faculty of the University of Rochester in 2006. 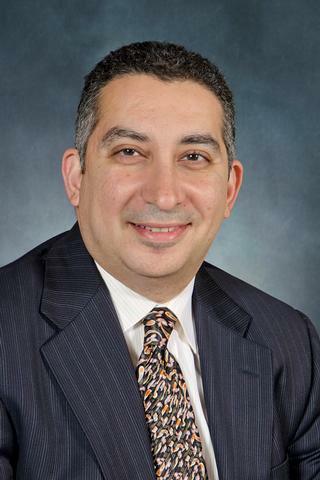 Dr. Girgis has a busy practice of general neurosurgery with a particular focus upon brain tumors, brain trauma, complex spine surgery and spine trauma. He has privileges at Strong Memorial Hospital, Unity Hospital, Rochester General Hospital, and Highland Hospital. He is actively involved in the resident education program at Highland, where he provides an intensive overview of operative Neurosurgery to rotating residents in our program. As a result of Dr. Girgis' efforts, this rotation has become a particular favorite of our residents in training. In addition to his practice in Rochester, Dr. Girgis runs an active regional clinic in Canandaigua, New York.